I often get messages about how to make vegetables tastier or how to prepare vegetables in a delicious way. To be honest, preparing vegetables in the same way over and over again would be boring after a while, wouldn’t it? And I think we don‘t want boring food! ? 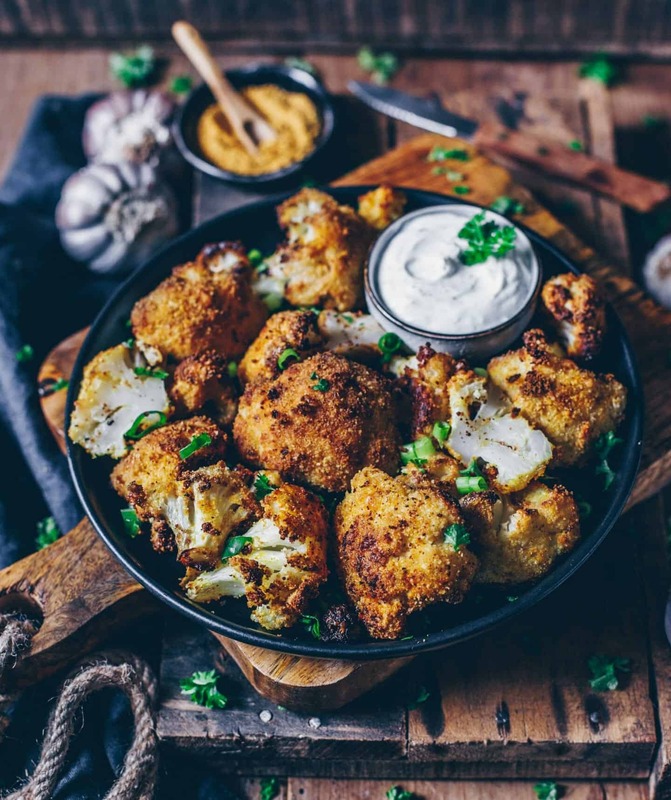 Therefore, I would like to share a recipe for crispy baked cauliflower with you today. 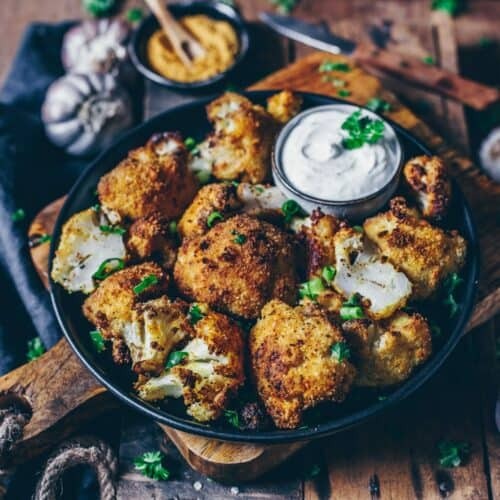 A great addition to different kind of meals and because of the preparation in the oven, these cauliflower nuggets are soft on the inside and crispy on the outside. Believe me, these Nuggets have the potential to convince even vegetable hater of the absolute opposite! Maybe you already know my recipe for “Barbecue Cauliflower Wings“. I intend to prepare them in a way that they will even remind of a vegan and healthy alternative to traditional chicken wings. They are not only vegan, but also gluten-free and almost oil-free – just baked with a few simple ingredients and then dipped in a sweet and spicy, homemade BBQ sauce afterwards. But I also think that today’s new recipe is a great healthy alternative, which reminds rather of nuggets. You can serve them not only as a side dish to a meal, but also as a delicious snack in between or at a party. I really like the baked cauliflower with my “cashew herb dip” or with my “tahini peanut sauce“. But it even tastes very delicious just pure or just with ketchup. For this recipe you need only a few ingredients and then you can start. I used a mixture of flour and breadcrumbs for my baked cauliflower, but you can also use any other breadcrumbs. Meanwhile, there are already different gluten-free varieties available, such as corn breadcrumbs. I would also advise you to read the list of ingredients when buying products, so that you can make sure there are only breadcrumbs included and no other additives. Optionally, you can also easily make breadcrumbs yourself by crumbling old bread. In this recipe I prepared the cauliflower for a leaner version in the oven. Optionally you can also fry the breaded cauliflower florets in a preheated deep fryer at 150 degrees Celsius for about 5-8 minutes. I’ve already tried that and of course, it tastes very delicious as well and is also ready a little bit faster. 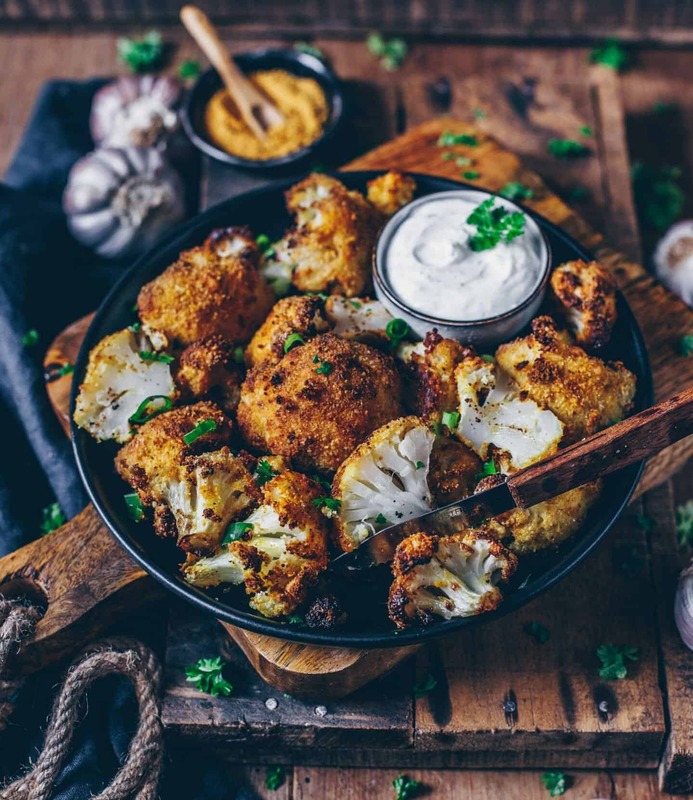 So, write down the good old cauliflower on the next shopping list and try this dish out! I’m sure you won’t regret it. ? You‘re welcome to leave me a comment if you have tried this recipe. You can also post a picture on Instagram and link it to @biancazapatka so that I can see your post and leave a comment with you. Clean cauliflower and divide into florets. Mix flour and milk in a bowl. In another bowl, mix breadcrumbs, yeast flakes and salt. Dip the cauliflower florets into the flour-milk mixture first, then roll in the breadcrumb mixture until they‘re relatively evenly covered with breadcrumbs. 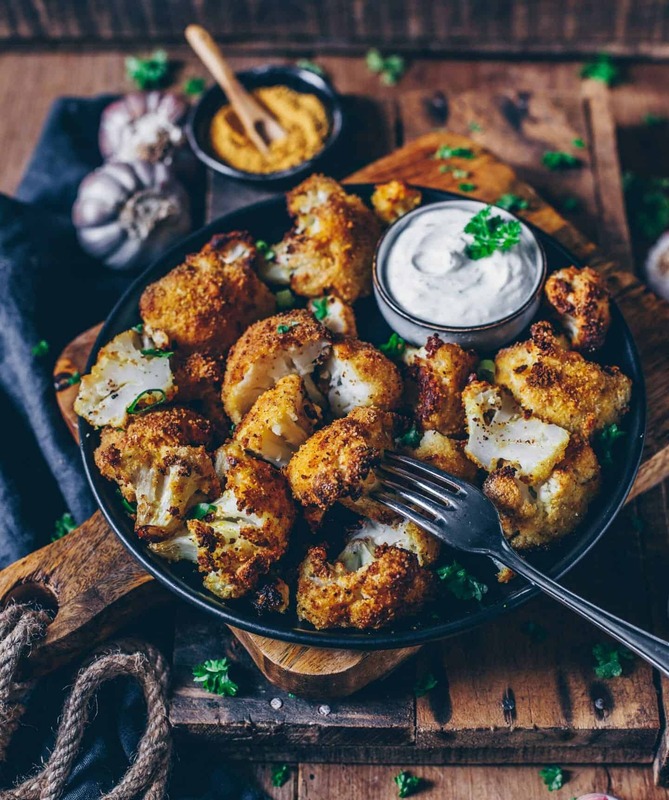 Place the breaded cauliflower florets side by side on a baking sheet lined with baking paper and drizzle or sprinkle with olive oil (it works best when you use olive or rapeseed oil to spray). Bake for about 30-40 minutes until the cauliflower florets are golden brown and crispy. If you‘d like to serve other side dishes or just a salad, prepare this in the meantime. 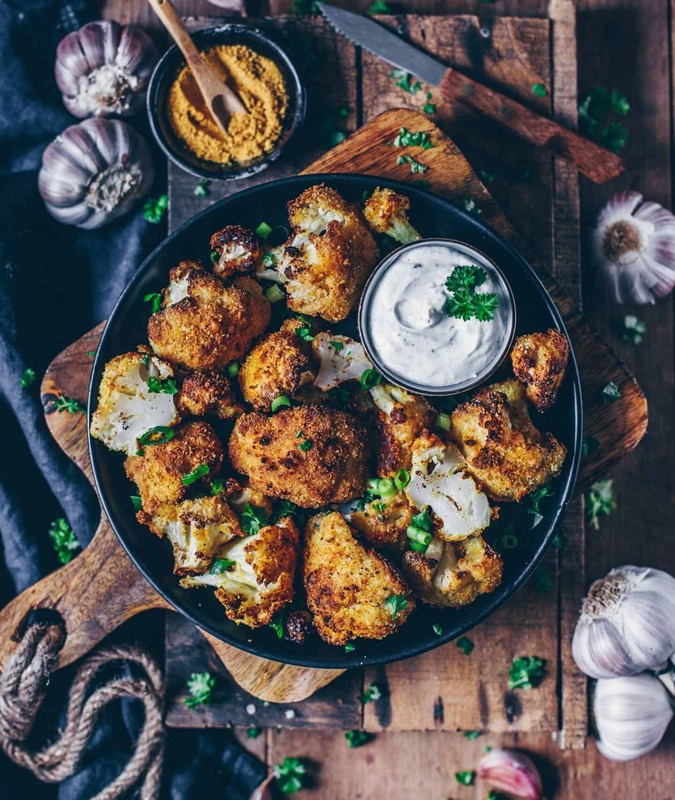 Once the cauliflower is ready, serve them with the side dishes and dips of choice or just pure. (Suggestions can be found in the text above the recipe??). Thanks! Looks easy to make and delicious. Thank you ?? I like this way of preparation very much. Maybe you‘ll give the recipe a try ? I’ve never seen such crispy looking cauliflower before! Such a delicious dish Bianca! So glad that you like it ? So glad to read that you like the recipe so much! I think it’s a great way to consume cauliflower ? I like this recipe very much ?